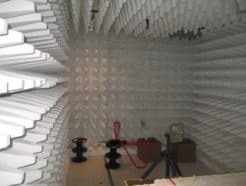 Used ETS Lindgren SpaceSaver semi-anechoic chamber for sale. These economical compact chambers are a popular choice for manufacturers who want to make pre-compliance measurements in-house. 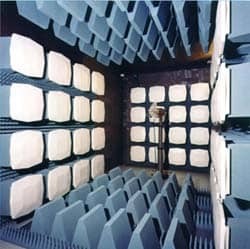 See the anechoic chamber guide for background information. 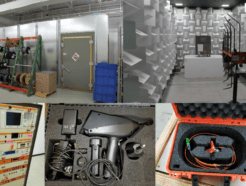 The SpaceSaver chamber is designed to perform ANSI C63.4/CISPR 16-1-4 and IEC 61000-4-3 compliant radiated immunity measurements. It can also be used for ANSI C63.4 pre-compliant radiated emissions measurement pre-scans, with limited height scan. 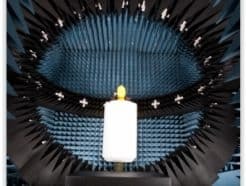 Frequency ranges for this chamber are 26 MHz to 40 GHz (radiated immunity) and 30 MHz to 40 GHz (radiated emission). Price includes installation. Shipping to your location not included. 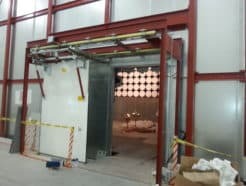 If interested in this chamber, please contact us at equipment@emcfastpass.com with any questions.